How Do We Save South Africa From Ruin?? The news is full of doom and gloom regarding our future in South Africa. In fact the media is full of doom and gloom regarding anything they spew out. This is their stock in trade. Good news is not as juicy and interesting to the public as bad news is. The news houses prey on this and create an air of fear. They know that someone who is scared will grovel for any information that might fill the vacuum that the media themselves have created in the first place. Don’t be fooled by this. In South Africa the news rooms try to paint the picture of racism. They try create the idea that blacks hate whites and whites hate blacks. The truth is that this is not true at all. I have many black friends, and actually when sitting around having a coffee with them I don’t see colour at all. I see a cool guy or girl who has similar interests, emotions, dreams and goals as I do. I find that actually we are not all that different at all. Then I see a news paper headline next to the road informing me of a racial incident that happened in another part of the country. I start to wonder how this is the case and why, because of this headline it seems to me that this happening everywhere, when it’s not. Sure, these things do happen, but they are not everywhere all the time. These incidents are actually quite scarce, but when you read it you think “Damn blacks,” or “Damn whites”. Right there you have been duped by the media. I don’t need to know about some racial incident that happened in Cape Town or Johannesburg. I live in Durban so that has nothing to do with me. All it’s doing is trying to export the violence into my area so that there is yet another racial incident created by the media and now they have something more to write about and sell more news. Let’s not be Sheeple, lets take our country back and live together peacefully. Sure I know that there are some things in our country that not ok. I know this. But I refuse to make it worse by being a pawn in the media quest for ratings and sales. Stop buying and reading the newspaper and watching the news on TV for one week. See how you feel about your country and your fellow man after the week. 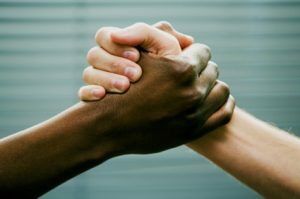 Think about some things that you have in common with someone of another race. It could be something simple like “We both liked the latest Star Wars movie” or “We both get sad when a family member dies” or try to really experience how the other person feels when something bad happens to them. You’ll realize that it’s much the same as you. Lastly, step back from all you think you know about the another race and really look. Look at the culture and ethnic and their background. Realize that it’s ok that they are different to you in some ways. You don’t have to adopt their culture, just accept it as being ok for them to have. Message to whites: Realize that many black people have had a very challenging upbringing. It is not all BEE happy times for all black people. There is still a lot of poverty, hunger and a generally challenging environment out there for them. Many grow up in harsh circumstances and are never given a chance in life. There are others of course that have had very good and stable upbringings too. Message to blacks: Realize that not all white are rich. Those that are have worked very hard for what they have and work hard to maintain it. Most are living hand to mouth and just trying to make it go right to put their kids through school and pay the rent. It is also a very challenging environment in the working world where white owned businesses cannot be hugely successful due to racial restraints placed on them by restrictive laws. In short, we are not actually that much different. The divide is created by the media. I am a white guy and know many black people who help me and I have helped many blacks. Both sides giving their help without caring about race.